Cheap, accessible, open hardware is driving the IoT. The Internet of Things (IoT) has been committing a lot of buzzword imperialism lately. It’s a hot term, marching across the technological countryside and looking for rich disciplines to capture. 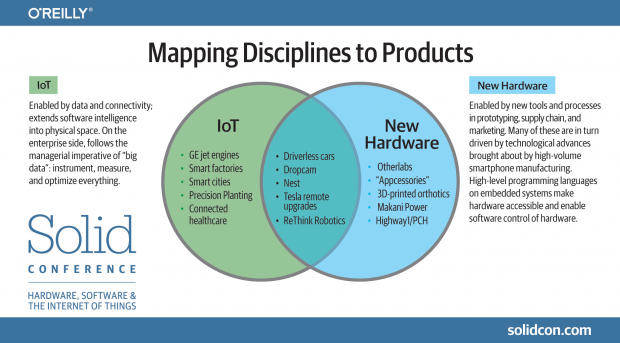 Electronics, manufacturing, and robotics, among others, have all become dominions of the IoT. The result is that the meaning of IoT has broadened to include practically anything that involves 1. technology, and 2. something physical. At the same time, practitioners have been trying to escape the IoT — and its early association with Internet-connected refrigerators — for years. Big enterprises that want to develop serious applications for the Internet of Things have come up with other terms for what they’re doing, like Internet of Everything (Cisco) and Industrial Internet (GE). So, hardware can be deployed in all sorts of ways that it couldn’t before, and at much lower cost. That means computing can extend into many places where it couldn’t before — like cornfields and streetlights. As it gets easier to deploy, intelligent hardware will find its way into practically every business — in the same way that going from mainframes to PCs made computing a feasible component of every business, and the Web made it possible to put every business on the Internet. At the same time, the Internet of Things has emerged as the business imperative that follows big data. Data science has already revolutionized every industry that touches the Internet. The Internet of Things promises to “Internetize” more industries and enable them to adopt the disciplined, data-driven business models that their Web-enabled counterparts have already built. Where this way of doing business has been available only to fields like advertising, finance, and online retail, it is now becoming available to industries that operate in the physical environment: logistics, agriculture, heavy industry, healthcare, mining, etc. The Internet of Things and the new hardware movement are not the same thing. Internet of Things is a big deal, but rather as a symptom of a general trend of moving innovation to the edges, to the entrepreneurs, to the developing world — to a much more democratic system. There are plenty of “new hardware” ideas that don’t overlap with the IoT: developing a 3D printer, for instance, doesn’t depend on connectivity and remote data processing in any significant way; on-board microcontrollers, smartphone-derived electronic components, and flexible manufacturing are the key enablers. The impact of the new hardware movement goes well beyond electronics and touches any industry that produces physical goods: it won’t be long before we see cars developed in an agile manner. On the other end of the spectrum, the new hardware movement is a primary enabler of the Maker movement; its accessible prototyping tools have become a popular hobbyist pastime. I’d argue that there are also IoT ideas that don’t follow directly from the new hardware movement. Many applications in heavy industry, for instance, don’t rely on agile hardware development but do make heavy use of connectivity and data processing. Recent shifts in the hardware development process have made familiarity with the entire process possible and even essential, in much the same way that a good Web developer can understand something about the “full stack” from databases and back-end software to front-end scripting and markup. Solid covers topics that exist in the overlap between the new hardware movement and the Internet of Things, as well as topics from each side. We focus slightly more on the hardware side, though, because it is on this side that practitioners identify themselves and see tools that they need to learn. Technical skills include industrial design, prototyping, electrical and mechanical engineering, design for manufacture, embedded-systems programming, and network engineering. Essential business topics in hardware include supply chain management and hardware marketing, which differs dramatically from software marketing. All of these disciplines are important in applications that call themselves IoT (for instance, developing a connected thermostat) as well as those that do not (like creating a desktop CNC machine or a 3D printer). There are fewer IoT disciplines that stand apart from what practitioners would include under the hardware label: data analysis, machine learning, and platform design are the essential ones. Solid covers everything of interest to the executive, entrepreneur, or engineer who needs to understand how the hardware stack is emerging and developing: we include practical sessions on design, prototyping, manufacturing, electrical engineering, security, the analysis of machine data, and hardware as a business — both startup and enterprise. In more far-sighted sessions, we cover next-generation materials, interfaces, and tools, and for the first time we’re including synthetic biology, which Joi (among others) has identified as the next discipline of interest to forward-looking technologists. The new hardware movement and the Internet of Things are both transformative ideas, and it’s as important to understand them now as it was to understand the Internet back in 1995. The premise beneath both of them is ultimately one of accessibility: it’s getting easier to start working on hardware, and the Internet of Things will eventually be as open to the contributions of the world as the regular Internet is today.